In Flint, Michigan, as the lead-poisoned water conditions worsen and residents are developing Legionnaires’ disease, politicians like Michigan State Governor Rick Snyder and State Attorney General Bill Schuette are finally getting their asses in gear. Flint’s water supply became contaminated after city officials changed the official water source from Detroit’s embattled water company to the nearby Flint River in early 2014. Despite residents complaining of foul smelling water, officials waved them off, encouraging them that the supply was just fine. Recently, Flint Mayor Karen Weaver called for declaring the situation a state of emergency, as did the Governor Snyder because—like the people of Flint knew—that water was and is dangerous. One of the highest levels of lead in Flint registered at over 30 times above the safe amount of lead in water by EPA standards and was found at the home of LeeAnne Walters, a stay-at-home mother of four in the spring of 2015. When researchers returned later that year, the readings at the Walters home were even worse. “We had never seen such sustained high levels of lead in 25 years of work,” he said. Elsewhere, according to the Detroit Free Press, the Michigan Attorney General Schuette is finally investigating Flint’s water contamination; locals think Schuette’s plans to run for governor in 2018 slowed his examination of Flint’s crisis. On Thursday, Governor Snyder announced that he’d asked for federal emergency aid for Genesee County, home to Flint. If federal monies do arrive, he’s discussed “possible… temporary housing, home repairs and low-cost loans” for residents hurt by the lead levels in the water. “We are utilizing all state resources to ensure Flint residents have access to clean and safe drinking water and today I am asking President Obama to provide additional resources as our recovery efforts continue,” Snyder said in the Thursday night statement. In addition to Genesee County’s numerous cases of lead poisoning in children and adults, Legionnaires’ disease, which is a severe manifestation of pneumonia, has come calling. 87 cases have been reported between June 2014 and November 2015 and 10 people have died. It’s not explicitly clear that lead levels have directly caused the uptick in Legionnaires cases but one expert says there’s a “very strong likelihood” it has. 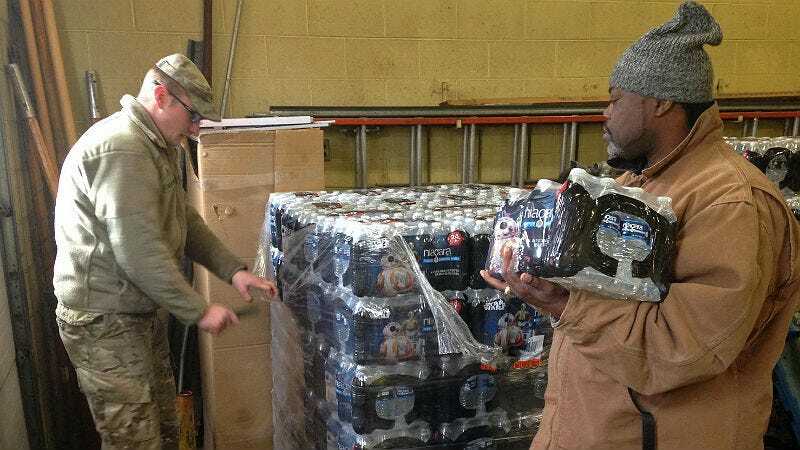 National Guard pass out clean water in Flint, image via AP.